Check out our brand-new women's voice of hope V-neck shirt. 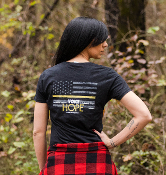 Shirt imprint is a USA gold line flag on front, with a full Imprinted USA gold line on back that says, "Always remember that it's your voice in the darkness that gives hope to those that really need it". Get these while they last. Be the first to own it or gift it. Shirts are made by Hanes and are 100% pre-shrunk Cotton. ON SALE NOW!! !